WINTER snow and sports, SPRING flowers, SUMMER golf, tennis, fishing, and hiking, and FALL foliage. What is your favorite season? Every season in Angel Fire offers natural beauty and special experiences for the getaway vacation retreat you need. Enjoy the season of your choice in our beautifully decorated mountain home. Nestled amongst aspen, fir, and pine at 8600 feet, views and scenic beauty abound, and you will be comfortable in our bright and open feeling home with three bedrooms, two baths, sleeping loft, cathedral ceiling glass front living/dining room, fully-equipped kitchen, and spacious wraparound deck. The home's location provides easy access to Angel Fire Village and Resort facilities, about 2 miles for skiing or golf, groceries, dining, horseback riding, children's activity area, and lake fishing. It is a short walk to Kit Carson National Forest trails for hiking and mountain biking. The historic and cultural richness of Taos (30 miles) and Santa Fe (90 miles) are close enough to experience. Entering the front door, you will begin to get the feel for the comfort of the house in the anteroom with recessed bench and coat hooks for adding or removing layers of clothing and changing footwear. Pleasant art work begins in the anteroom and continues throughout the house. Furniture and decor in our home is a mix of southwest and antique. Antique winter sports equipment is attached to the walls of the 28-foot cathedral ceiling living/dining area which is to the front of the house with large glass windows from floor to ceiling. The living area has a wood-burning stove, over-stuffed southwest sofa, and an entertainment area with TV and CD player. The dining area features an antler chandelier and large comfortable chairs. The kitchen is fully equipped with cookware, and Dansk pottery dishes ready to be used. The two downstairs bedrooms share a bath; one bedroom has a queen-sized bed with antique headboard, and the other has an antique double-sized brass bed. The master bedroom upstairs has an antique cherry bedroom set with queen-sized spool bed, a private bath, an adjacent sitting area with a single bed/couch, and large windows looking through the cathedral ceiling living/dining area out the front of the house. All of the bedrooms have ceiling fans and ample closet space. There is a Sleeping Loft which is a small room off the stairway with a double mattress...close the half door and you have a private cozy quiet sleeping space for two. There are two children sized foam chairs that fold out to make comfortable beds for little people. beds for 2, 1 bed for 1, 2 fold outs for small children...4 separate spaces. The entry, hallway, kitchen, downstairs bath, and dining area floors are tiled. The living area is wood floor, while the rest of the house is carpeted. Clothes washer and dryer are available in a closet off the downstairs hallway. Heat is provided by a forced-air propane furnace. We ask that you NOT SMOKE in the house, and that you NOT BRING PETS. The large wraparound deck has a gas grill, chiminea, large umbrella table, chairs, lounge chairs, covered area, and ample bench seating. If you are a smoker, ash trays and cigarett recepticles are on the deck. When you smoke outside, remember to be extremely cautious as FIRE DANGERS in a mountain forest site with a wood home and deck are ever present. Come enjoy the natural beauty of the mountains in a comfortable home-away-from-home. Check in with the home front as long distance telephone calls are free. A wifi fiber optic internet connection is available, so bring your laptop. Dish Network Family package with local channels is available for tv viewing. Very large groups (up to 40) can be accomodated by renting the Bunker Hill house next door, and the Bunker House across the street. A great option for family reunions, wedding parties, or any large group occassion. Contact us for more information. 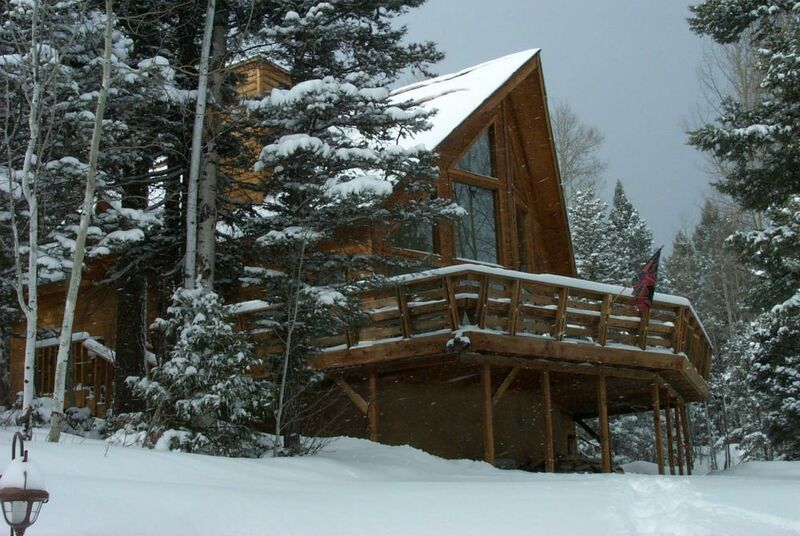 Hi, we are Guy and Kay George, owners of the George Cabin in Angel Fire, New Mexico. We are retired, and live in Gainesville, Texas. We have 3 children, and 1 grand daughter. Our 3 children live in Gainesville, Texas; London, England, and Dallas,Texas. We get to our house in New Mexico often. We enjoy winter sports, golf, and square dancing. We ran a Bed and Breakfast in Gainesville for eight years, and know that we have made our cabin comfortable for our guests. We bought our home in Angel Fire because it has lots of snow in the winter, cool summers, and is a comfortable drive from North Texas. Our home is tastefully decorated and conveniently located. We are 2 lots from an entrance to the Elliott Barker trail, close to the grocery store, golf course, and ski lift. Well equipped. Many basic cooking ingredients available. Stairs into house, and doors inside are not wide. With all of the deer, elk, humming birds, hiking and mountain biking trails right outside the front door, we didn’t even need to leave the house. Great place to stay. The kids loved the hobbit hole! Wonderful place. Would definitely return. My wife and I needed a few days in the mountains and this place was exactly what we were looking for. Easy access to town but felt private and a part of the woods. A fire ban prevented us from having a fire which we love to do but that was about the only thing missing. The cabin was well stocked with everything we needed. Everything was clean and well cared for. I particularly loved the deck just sitting out there enjoying Mother Nature. There was a shade missing from one of the big windows in the main room and we prefer a hotter temp on the hot water heater for hand washing dishes. Also like a little softer bed. With the exception of the shade the other two are just personal preferences so not a knock on the cabin itself at all which is why I still rated it five stars. Really appreciated the communication from the Georges. Very helpful information. Thanks for sharing your wonderful cabin with us. We will likely try to reserve the very same cabin again in the future and could easily bring more people with us. Large deck for enjoying the outdoors. Plenty of sleeping room for 5 people. Parking is a little tight, but doable. Enjoyed our stay! Prefect size and clean. Very close to Angel Fire. Great property and close to Angel Fire. It would have been nice to have the bird feeders filled as there were lots of birds, including hummers. It also would have been nice to have the deck swept and the chairs all together (they were scattered all over the deck). We had a wonderful time at the cabin, everything was clean & accomidating. The location is perfect! Just down the street from the market & ski slopes but far enough up the mountain to get great views & weeven woke up to deer in the yard one morning!!! Angel Fire is located in the Mareno Valley in the Sangre De Cristo Mountains. Our house is within 3 miles of skiing at Angel Fire Resort, golfing at Angel Fire Country Club, hiking the Elliott Barker Trail, the local grocery, and numerous restaurants.